Hi everyone. I have been building a fogless coolant mister and I thought I would share how I did it. Most materials are available at a home improvement store. I have rigged up a solenoid valve which I can actuate from EMC2. I am pretty pleased with the result, and the total cost was about $120 dollars. Step one: Go shopping (any home improvement store will get you started). 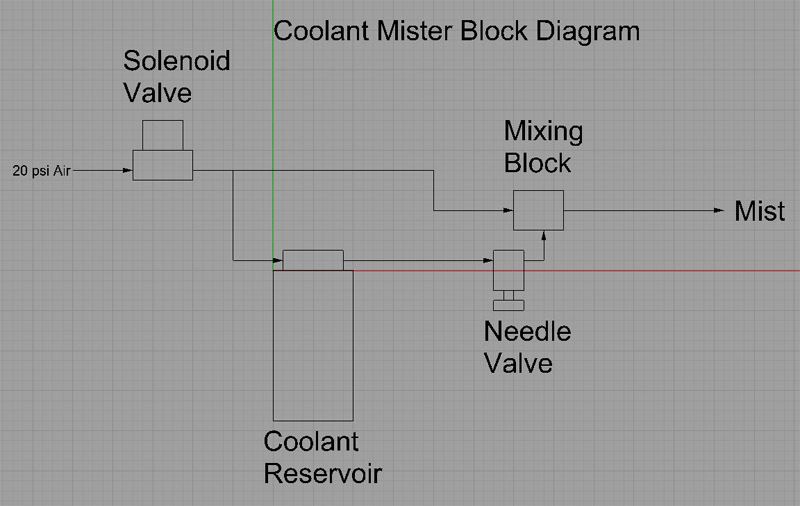 Question about using WD-40 as coolant in my Kool Mister instead. Last edited by UWP_Wes; 04-07-2010 at 12:36 AM. This system works by putting air pressure on the top of the coolant to force it out to the nozzle where it is mixed with air. We need to be able to get the coolant out of the bottom of the canister. We will need a special fitting to do that. I did this by turning down a barb fitting and soldering it to a compression fitting. This way I can feed a hose to the bottom of the canister and seal it at the outlet at the top. out. Anyway I looked up the links and thought I'd repost here also. You need to build a nozzle to mix the coolant and air and get that to where you want it. You do not have to follow my dimensions exactly. The key concepts are that you need a very small outlet nozzle to choke down the air flow and maximize the velocity. You also need a small passage for the coolant since the coolant flow rate will be much less than the air flow rate. I made mine from brass so I could solder it. The pressures in the system are low enough at this point that you could easily use aluminum or something and just epoxy things together. The nozzle is brass rod which I bored from both ends with a 3/32 drill bit (hence the short length). Then I added an extension which is bored most of the way with 3/32, then through with 1/16 drill bits. I also whipped up a little mounting arm. You can copy my design if you like. It clamps to the spindle collar and articulates in 3 points. CNC helped for this! I added a solenoid valve and an air nozzle to clear off chips. I also made a mounting bracket. I added the tubing from the nozzle to the canister. The mister works very well. I run about 15psi and the coolant and air use is pretty minimal. I wrapped the tubing in vinyl tape for protection. It looks a bit low rent, but it was the best idea I could come up with. I initially had plastic lines from the canister to the nozzle. They were too stiff and would pull the nozzle all around as the machine moved. I switched to 1/4 OD vinyl tubing and am much happier. I initially had copper tubing for the nozzle. This was very flimsy and in my opinion the wrong inside diameter to work properly. The brass is much better. I have seen some examples where a MIG welding tip was used a nozzle. It might work. The mounting bracket needs to be strong. Mine is too weak. I added a barb fitting to the end of the tube inside the canister to give it some weight and keep it on the bottom. How does this set up eliminate the fog? Most misters use a venturi effect to pull coolant up from a reservoir to a mixing block to mix it with air. The side effect of this venturi is that the coolant is atomized, or turned into tiny, tiny droplets dispersed in the air. This atomized coolant is not dense enough to to follow the stream of air and can float up as "fog". A fogless system uses air pressure to force the coolant from the reservoir to the mixing block. The coolant droplets are much larger (and there are fewer of them). These larger droplets tend to stay inside the air stream and avoid forming "fog". See this diagram which I lifted form Bob Warfield's site www.cnccookbook.com. You are using a clear plastic domestic water filter housing. My shop has used these for coolant filters for years without problems and I have suggested their use many times here on cnczone. Recently, however, someone did install one and the plastic housing fractured making a bit of a mess with coolant all over the place. With your setup the housing is under air pressure, not liquid pressure, and when it is almost empty of coolant it is almost full of air at 15 psi; if this housing fractured it could fling plastic shards around. A metal shroud around it may be a good idea.